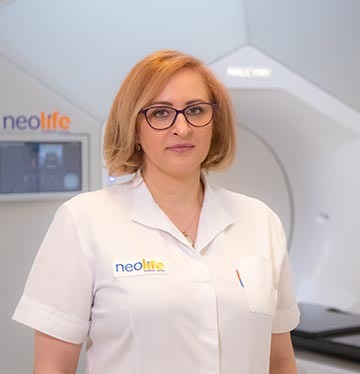 Neolife Medical Center in Bucharest is equipped with the most modern and performant linear accelerator - TrueBeam - with the help of which radiotherapy treatments are carried out at the highest standards and in compliance with the newest international protocols. 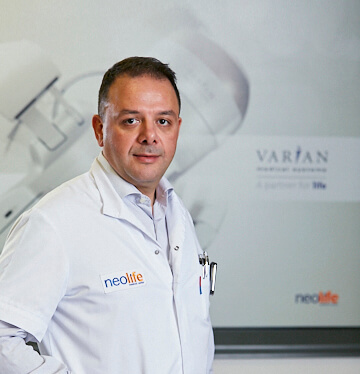 Manufactured by Varian Medical Systems in the United States, TrueBeam is currently the most advanced equipment available used in radiotherapy treatments in major medical centers worldwide and has been available in Romania as of 2014, being the only one of its kind in South-Eastern Europe. 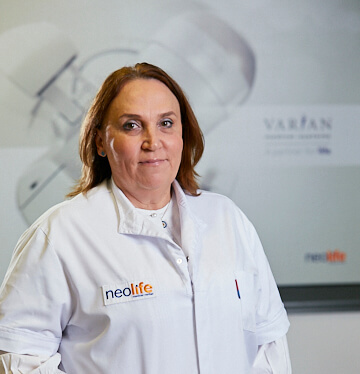 Ever since the inauguration of Neolife Medical Center in Bucharest, in 2014, stereotactic surgery treatments have been performed for the first time in Romania, for treating patients diagnosed with: carcinoma, melanoma, meningioma, glioblastoma, cavernoma, etc. 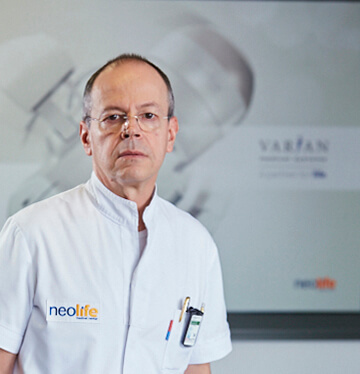 Radiotherapy and radiosurgery treatments performed at Neolife Medical Center in Bucharest have minimum side effects on organs and healthy tissues around the tumour, and no major influence on the quality of patients life. For each one of these angles, the intensity of the beam varies (is modulated) and changes shape in order to mould around the shape of the tumour. All these variations of the angle and shape of the beam allow for the delivery of the radiation dose on each side of the tumour, minimising the exposure of the healthy tissues surrounding it. Unlike IMRT, where the device rotates around the patient and stops in certain fixed angles in order to deliver the dose, VMAT/RapidArc delivers the prescribed radiation dose during one single 360-degree rotation, usually in a 2-minute interval. VMAT/Rapid Arc uses a special software and a state of the art accelerator which allows the shortening of the duration of treatment (8 times faster), increasing the patient's comfort. It is image guided radiotherapy and is used in order to confirm with high accuracy the position of the tumour by using the portal imaging system or the OBI system (a system that acquires images of the tumour during treatment, improving the positioning of the tumour). There is also a special devise of imaging integrated in the programs for automated repositioning and movement management. This allows the physicist to ensure a treatment that is fully synchronised with the patient's breathing. It is the radiotherapy with radiation beam that acts outside the body, based on a treatment planning determined by establishing the set of beams and defining the radiation fields by 3D conformation for the purpose of obtaining the best therapeutic dosages with respect to the tumour mass and the minimum dosage for the near organs that are exposed to risks (these organs should receive a very small dose of radiations). Stereotactic radiosurgery is the radiotherapy treatment in which high doses of irradiation are administered with very high accuracy in the targeted tumour mass, reducing at the same time the dose received by the surrounding healthy tissues. Why is Radiotherapy administered ? Many types of cancer can be cured by radiotherapy or radiotherapy combined with surgery and/or chemotherapy; when used before other treatments, it aims to reduce the size of the tumour, and when it is used after other therapies, the purpose is to stop the growth of residual tumour cells. Definitive radiotherapy, as the only method of treatment, is used, for example, in certain stages of the Hodgkin disease, in some non-Hodgkin lymphomas, cancers of the central nervous system, and certain types of cutaneous cancers, certain carcinomas of the head and neck, initial stages of prostate carcinoma, gynaecological tumours. Alleviation of symptoms; sometimes, the cure of cancer is not possible, but the alleviation of symptoms makes the patient's life more comfortable. Palliative radiotherapy treats specific problems caused by cancer, such as pain or bleeding. The reduction of tumour size implicitly leads to the decrease of pressure exerted by the tumour on the neighbouring organs (for example, brain or bone marrow). How is Radiotherapy administered ? Radiotherapy can be administered from the outside of the body (external) or from the inside (internal, brachytherapy/interstitial therapy); the patient can receive a single type of radiotherapy, or a combination of both types. How does Radiotherapy work ? Radiotherapy is targeted on the area with the malignant tumour. Radiations affect all tissues in the treatment area, but the maximum effect is exerted on the cells that divide rapidly and actively, such as tumour cells. 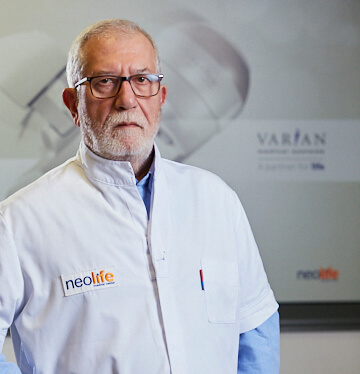 If the radiation beam also damages healthy cells, the patient experiences side effects depending on the radiosensitivity of the tissue; for example, tegument cells are more radiosensitive than hepatic cells, therefore they are more likely to suffer damage caused by radiotherapy. The patient does not experience any discomfort during radiotherapy. How do we know whether the treatment is efficient? The patient will undergo medical tests and examination throughout the treatment. These tests help the doctor determine whether radiotherapy is efficient. The effects of the treatment are not always immediate - several weeks may be needed after completion of treatment for the assessment of the effect of radiotherapy. if the tumour was not reduced or it has become metastatic, the patient can receive other treatment for curative, respectively palliative purposes; if radiotherapy is performed for palliative purposes, the alleviation of symptoms reflects the efficiency of treatment. What professionals are in the treatment team ? psychologist - helps the patient cope with the emotional aftermath of cancer and its treatment. You need Radiotherapy Treatment or Consultation?